I spend a lot of time considering how to make my family meals smarter. How to optimize the nutritional value while providing great flavor and adequate portion sizes. Having kids who are growing and are athletes has changed the food landscape in our household considerably. After swimming hard for 2 hours after school I want to be sure something hearty with ample protein is ready when they walk through the door. Maybe that sounds like a pretty basic goal but I find it tricky. Serving food everyone likes, not too heavy on saturated fat, providing enough vegetables, that doesn’t take a few hours after we get home to prepare and that makes enough for multiple servings isn’t always obvious. It’s a bit of a culinary Rubik’s Cube ordeal for me at times. I will confess I find it easy to get into a cooking rut too. When I find a dish that really works to fit our needs, it’s tempting to put it on ‘frequent repeat’. Then sadly, like over-listening to a favorite new song, it’s soon is the dreaded meal. When I was growing up there was a meal template seen on everyone’s dinner table pretty much; meat, a side grain and some sort of (usually boiled) vegetable. These days the internet abounds with creative twists. 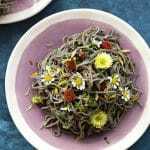 Spiralized vegetables turning into pasta to replace traditional starchy counterparts. Cauliflower ‘rice’, again wedging some vegetables on the plate instead of actual grains. 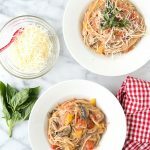 I made a discovery a few years ago, really out of exploring gluten-free options, that I feel is a great smart swap providing a powerhouse of protein and fiber: Black Bean Pasta. As it sounds, the pasta is made solely of black beans and water. 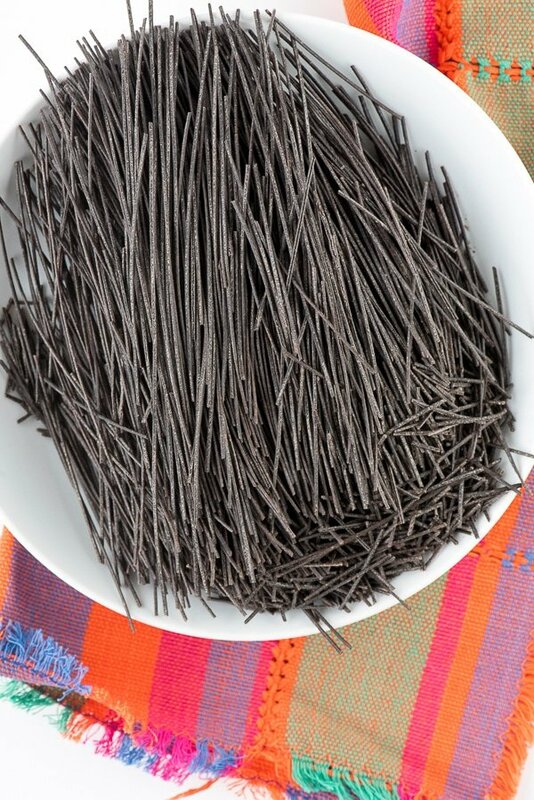 The spaghetti shape cooks into regular textured pasta noodles and tastes exactly like black beans, which we love. Everything about it makes a perfect option for a smart meal. I do think since we ‘eat with our eyes first’, black food does not make one want to dive in for a bite as other colored foods do however. I’ve addressed that by making Taco Pasta, providing all the flavors one would find in a taco layered colorfully onto the black bean noodles. Instead of traditional pasta sauce, mild or medium salsa is converted to a spicy sauce with lean ground turkey thigh meat, some low-fat sour cream (I used Horizon Organic) and some taco seasoning. Simple, fast, creamy and tasty! With my goal being to add color, texture and vegetables, the pasta is topped with finely shredded iceberg lettuce, finely shredded red cabbage, diced tomatoes (I used yellow tomatoes for their sunny appearance) and a sprinkle of Mexican Blend cheese. 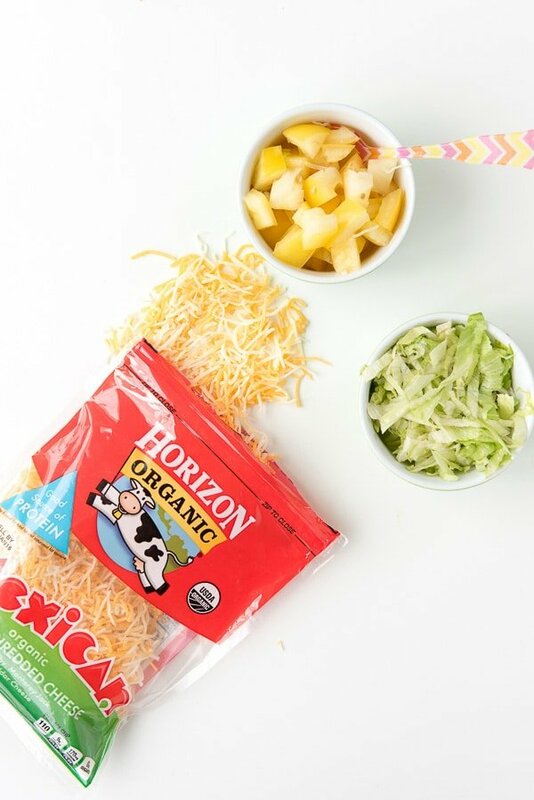 I often buy packets of Horizon Organic’s grated Mexican blend cheese for all sorts of dishes and to save time grating myself. The combination of flavors really are of a taco in a different form. My family loves it and the longest lead time preparation is chopping and shredding the vegetables, so about 15 minutes. 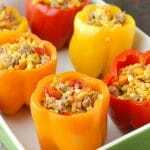 It’s a filling, delicious and nutritious option for your dinner table. Naturally gluten-free too! 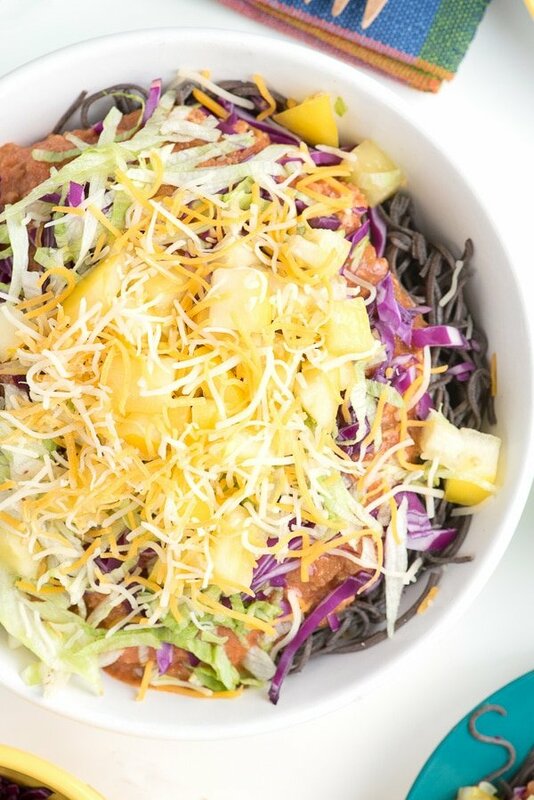 Black bean pasta noodles are an excellent option for a protein and fiber packed meal. Creating a taco flavored pasta dish allows added vegetables and flavors everyone loves. The noodles are naturally gluten-free. There are many varieties of black bean pasta and I've linked to the type I used in the recipe as an online purchasing option if needed. Prepare the black bean pasta as instructed on the package. While the pasta is cooking, prepare the sauce. In a large skillet over medium heat, add the olive oil. When it begins to shimmer to the eye, add the turkey and sauté until it is fully cooked. Sprinkle with the taco seasoning and toss to coat the turkey. Add the salsa and the sour cream to the skillet. Stir to fully combine and allow to simmer for five minute, still over medium heat. When the pasta has been cooked and drained, add it to a serving bowl. Layer the sauce on top of the noodles followed by the lettuce, cabbage, tomatoes and the cheese. Serve immediately. You can learn more about Horizon Organic by giving them a follow on social media too: Facebook, Twitter, Pinterest and Instagram! They have been a preferred brand partner and local love of the Boulder Locavore family for a very long time! OMG! Yummy and colorful! I can’t wait to try it! I am so interested in finding out more (and trying) those black been noodles. I never knew these existed! This is a fantastic meal! 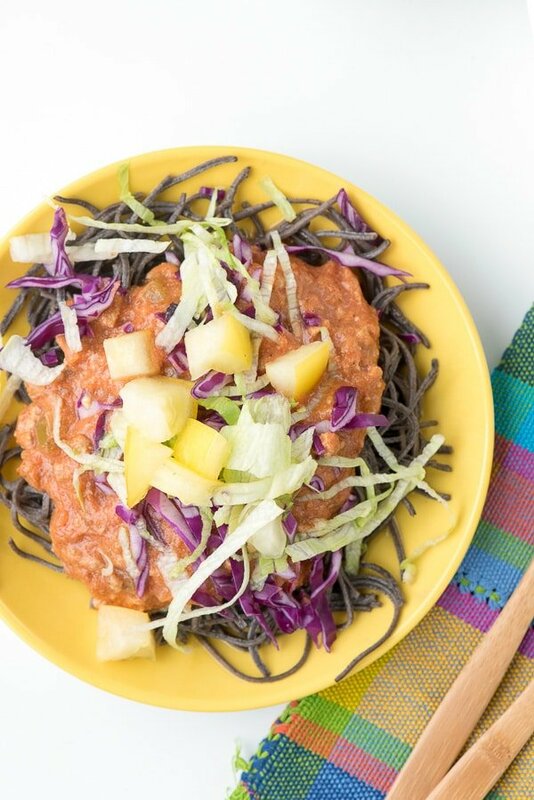 What a great way to use black bean noodles. This is my first time to hear of them, I’d love to try ’em. Wow that looks delicious. I had no idea there was such a thing as black bean noodles. This looks SO good! I have never seen or tried black bean noodles. I will have to look for them to try. I am having so much fun trying out the different recipes I’ve encountered lately. 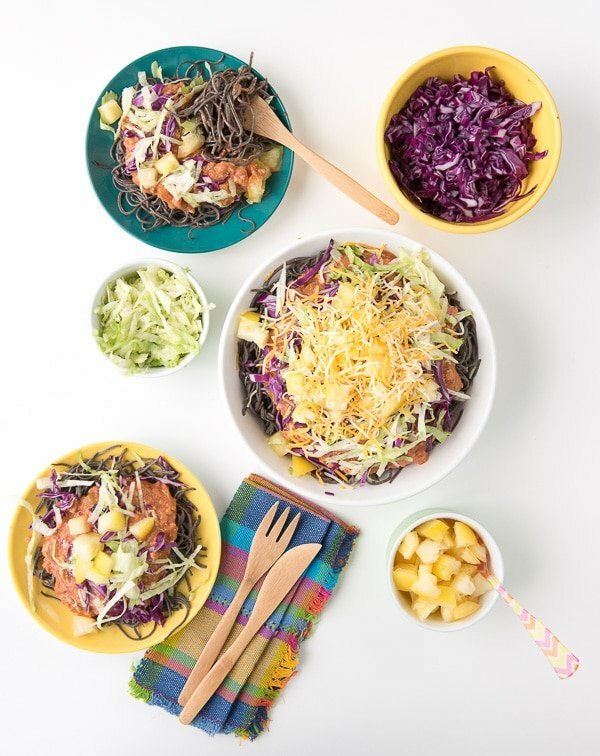 The taco pasta looks delicious with all the colors mixed in with the black bean pasta. I have not heard of black bean noodles. This sounds and looks so good! This looks like a delicious dish. 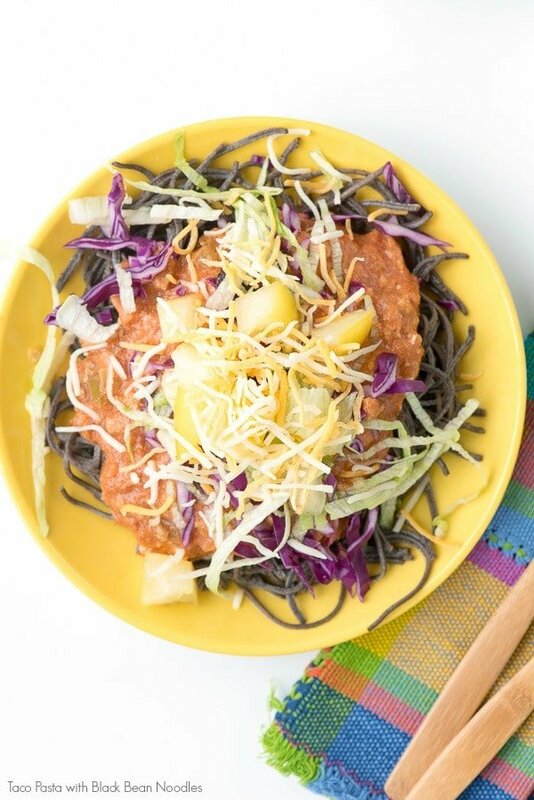 The Organic Black Bean Spaghetti Noodles are something i want to try. I will have to pick some up and try this recipe. I haven’t heard of black bean noodles. Can’t wait to try your recipe. 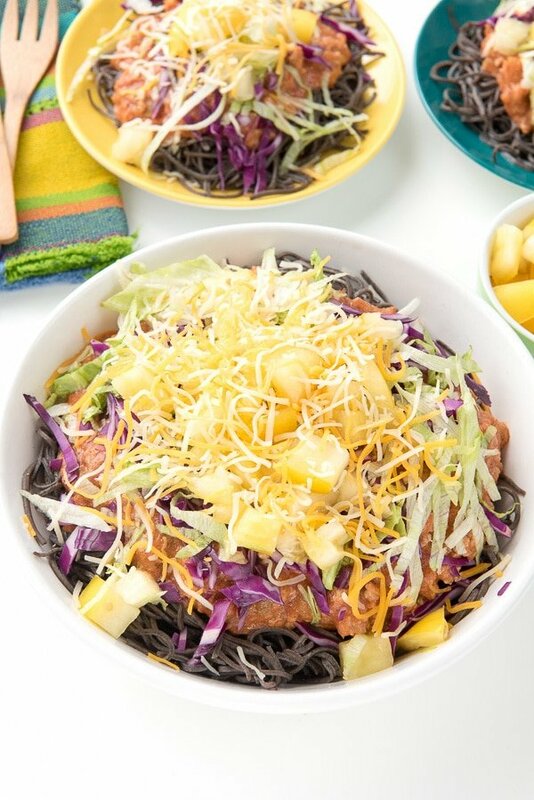 I have never heard of black bean noodles, how neat of a dish idea. I will have to give it a try! Oh that is such a fun meal. We could totally try this out. With a nice spicy sauce, I bet it hits the spot. Thanks Eric! I don’t recall how I discovered them a few years ago but I realized there are many more pasta options available out there than most of us know about. I have never heard of black bean noodles. This dish sounds delicious. That looks yummy. 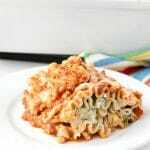 My kids love taco and pasta night, so this might be a big hit for dinner with them one night! We eat Mexican food for dinner at least once a week, this looks perfect for us to try! Thanks for this gorgeous recipe! Thanks Mitch! I so appreciate it. This sounds very intriguing. 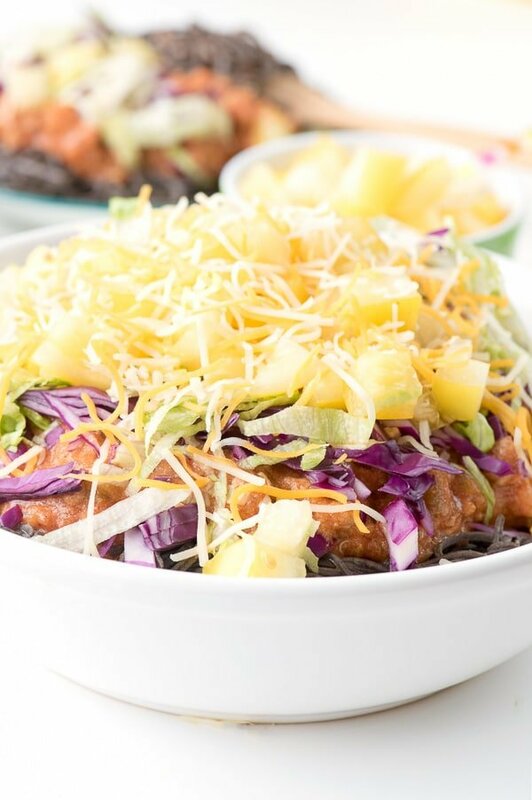 Not sure how my husband would react to black bean noodles, though… I have to say that I’ve pretty much quit buying pre-shredded cheese while I’m at home, simply because it keeps better in blocks. Grating cheese is one thing I’m putting more effort into in my old age. And making yogurt. What I need is a grocery store that carries things like black bean noodles. I’m guessing that when a Sprouts store opens on our side of town I’ll be able to find them there. The color of the noodles can be a stumbling black for those of use who are color driven in our food! Ironically my husband and kids did not bat an eye the first time I made them; it was me that was struggling until I took the first bite. I think all the wonderful colors in this recipe downplay the noodle color too. I find ordering from Amazon.com is often cheaper than the per package price I find at the store for many things as well as shipping is free over $25. If there are unusual things or dry stapled I find they are less effort and a better price. That looks delicious! I love the use of black bean noodles. They have so much more nutritional value than plain noodles. “Culinary Rubik’s cube” – perfect description! Black beans in any form are one of my favorite foods, and in pasta form? Count me in! Another recipe I’m looking forward to trying. If you love black beans Nancy, as do I, you’ll love this pasta. I made another version for Halloween a few years ago too: Diablo Eyeballs and Black Bean Pasta! It’s really delicious and comes in different pasta forms too. We are obsessed with Mexican food in our house. This sounds right up our alley.